Nowadays you can use the internet to listen to your favourite music or radio shows. You can also download digital audiobooks to play on your computer (to 'download' something means to transfer a file from the internet to your computer). 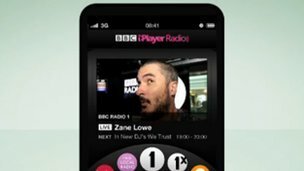 Many music and radio websites are also available in 'app' form - which makes it easy to tune in via your smartphone or tablet when you're on the move. The web has really opened up the airwaves. When you're online, you can now listen to radio stations from all over the world on your computer, tablet or smartphone! You do this by 'streaming' the output from the radio stations. Streaming allows you to listen to something without needing to save or download large audio files to your device - you simply listen to it using your internet connection. You can also use streaming to access on-demand services, such as BBC iPlayer - where you can tune in to live radio shows and also find a selection of radio shows that have already aired during the past seven days. 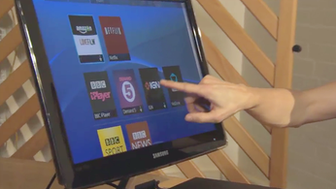 iPlayer is available on various internet-enabled devices. Take a look at the BBC Links section at the end of the guide for more information on exactly which devices and services offer iPlayer. A good place to start exploring UK radio is by taking a look at the Radioplayer website. It allows you to access a wide range of BBC and commercial radio stations in one place. Just click on 'Browse' for an A-Z of all the participating stations. You can listen to live shows as well as selected programmes or highlights from shows that have already been broadcast. As with many websites, Radioplayer also comes as an 'app' (short for 'application' - a type of computer program). An app is often a version of the original website. You can download apps to your smartphone or tablet. The Radioplayer app, for example, is free to download. There will be a specific symbol (or icon) on the home screen of your smartphone or tablet where you can search for apps. Once you've found an app, you can download it to your device. When you've done this, it will appear on the home screen of your device. And when you want to access the app, you simply tap it to get started. On the Radioplayer app you will be given the option to either search or browse the radio stations. In addition to the main iPlayer, BBC iPlayer Radio is a service that can be accessed on your computer, smartphone or tablet device by visiting www.bbc.co.uk/radio. The smartphone version has been adapted to make it easier use with your handset. You can listen live to any BBC radio station, view programme and track information, access the schedule, see photos and download podcasts. There is also an app available for some smartphones - you can find details of this in the BBC Links section at the end of this guide. Podcasts generally come in two forms: audio and video. An audio podcast is often a radio show (or highlights from a show) specifically recorded for the internet. It can be downloaded and listened to whenever and wherever you like - either on a computer or on a portable media player. The BBC has its own podcast directory where you can choose from a large selection of free podcasts. You can download a podcast or subscribe to receive a podcast (a bit like you would if you subscribed to a magazine and had it delivered each week). In order to subscribe to a BBC podcast, you'll need to install some special software (which is usually free of charge). Once you've installed the software, it will check for new episodes of your chosen series and automatically download them for you. 'MP3 players' are a type of portable media player. They allow you to store digital audio files on a memory chip so that you can play music and listen to podcasts wherever you like. The most well-known brand is the iPod, although there are others that offer the same features, and sometimes extra ones (such as FM radio). The great attraction of the MP3 format is its ability to compress the digital audio files so that huge amounts of data can be stored on them. MP3 players are small, lightweight devices - making them ideal to carry around or wear. The audio files (music or podcasts) can be listened to with earphones or headphones, or played through speakers. You can organise the music stored on your computer (or other device, such as your MP3 player) by using a music management program. iTunes was the first one to gain mainstream popularity. Other management programs include Tomahawk , doubleTwist and MediaMonkey. iTunes is produced by Apple, but you don't need to use an iPod, iPad or iPhone to use iTunes - there is also a version which can be downloaded onto computers with Microsoft Windows. As well as organising your music, you can use iTunes to purchase and download a variety of products, including music, films, audiobooks, apps and podcasts. Music streaming services are also available online. These allow you to listen to music without downloading files. Spotify is perhaps the best known of these services, but similar ones include Rdio, Deezer, We7 and Last FM. A vast collection of music is available on these kinds of services. You can access it on your computer or on various apps for smartphones and tablets. In general, a free version of a music streaming service will only allow you to play music on your computer (and not on any other device), and there may be certain time and data limits. A subscription version will usually remove adverts and allow you to use the service as an app so you can download the music and listen to it on a handheld device, as well as on a computer. Audiobooks are recordings of books being read aloud, often by well-known actors or presenters. They can be very useful when you can't read a book because you're busy doing something else - for instance, when you're cooking. Audiobooks are also very useful if you have a visual impairment and find it hard to read normal books. Digital audiobooks are increasingly becoming available as downloads that you can play on your computer, smartphone or tablet. For more information about downloading audiobooks, take a look at Digital Unite's guide to 'Radio, Audiobooks & Podcasts' in the Related Links section below. Digital Unite: What is an MP3 player? Podcasts & Downloads: What is podcasting?